Having never won a major tournament, ailing football giant SSC Napoli had criminally underachieved. Their fanatical support was unequalled in both passion and size. None was more feared. But how they ached for success. On 5th July 1984, Diego Maradona arrived in Naples for a world-record fee and for seven years all hell broke loose. The world’s most dysfunctional football genius and the most dysfunctional city in Europe were a perfect match for each other. Maradona was blessed on the field but cursed off of it; the charismatic Argentine, quickly led Naples to their first-ever title. It was the stuff of dreams. But then came the dark side. Maradona’s transfer fee was rumoured to have been financed by the city’s mafia – the Camorra. Diego could do as he pleased whilst performing miracles on the pitch, but when the magic faded…? 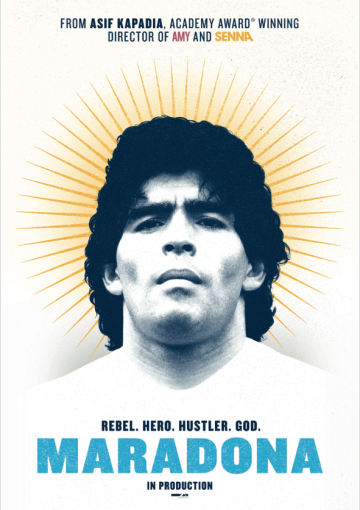 The third film from the Academy-Award nominated, BAFTA-winning team behind SENNA and AMY, the film will be partly constructed from over 500 hours of never-before-seen footage from Maradona’s personal archive and in the style of SENNA and AMY, will be a high-end and definitive feature documentary made with the full support of Maradona.